Cyrano’s Cheese an Bacon Mushrooms are perfect for a tailgating party, or anytime you want to have something special. 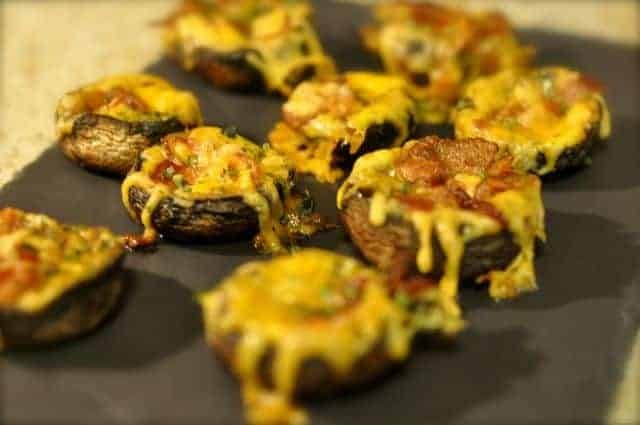 These are some of my favorite types of stuffed mushrooms, I personally think most things go better with bacon. Cyrano’s is located in Vail, Colorado. Preheat oven to 375 degrees. Clean mushrooms by rinsing them off with cool water under the tap, and then brushing the mushrooms with a damp paper towel to knock off any dirt that may be on the mushrooms. Arrange the mushrooms in two shallow dishes, steam side up. Put cheese on top of mushrooms and sprinkle with bacon bits. Cover pans with foil and bake at 375 degrees for 20 minutes. Remove from oven; sprinkle with parsley. I was a prep cook at Cyrano’s from 1976-1978. Your recipe isn’t quite correct. I know as I prepared them daily for 2 years! In a ramakin, place the mushroom tops an cover the whole dish with cheddar and bacon bits. No parsley necessary. You don’t need to cover each shroom separately. Thanks Keith. I hope I was pretty close, it sounds like I was trying to make it all fancy doing it one at a time. I hope it didn’t make them taste differently. This made a wonderful appetizer! Everyone really liked it!